We get pretty excited when we learn of new photographic technology, just like when machinists learn of a new tool coating or substrate material. So we were really excited when we learned of the Mesolens Confocal Microscope being developed at the University of Strathclyde in Glasgow. The mesolens is capable of showing three-dimensional images within cells and tissues at the same time as showing the whole organism, something which is currently not possible with any single imaging device. 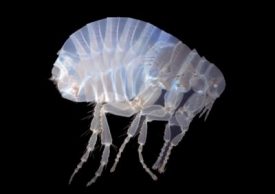 Fleas typically aren't much larger than the period at the end of this sentence. This entry was posted on Thursday, April 26th, 2012 at 12:05 pm and is filed under Break Room, Engineering. You can follow any responses to this entry through the RSS 2.0 feed. You can leave a response, or trackback from your own site.